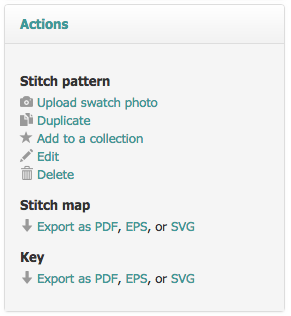 By request, the view controls on each stitch pattern’s detail page now include a “Metadata” checkbox. 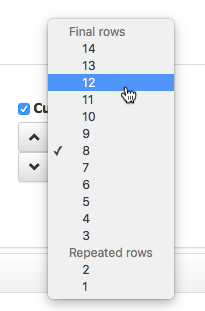 Click this option, and the stitch map will be shown with three bits of metadata in its lower-left corner: the name of the pattern, the name of its contributor, and its URL. On a related note... going forward, I’ll probably include metadata when posting stitch map images on Ravelry or on social media. That way, anyone that sees the image has a way of tracking it down. Bonus: those of you with subscriptions have the option setting a preference such that you’ll see metadata by default every time you visit a new detail page. 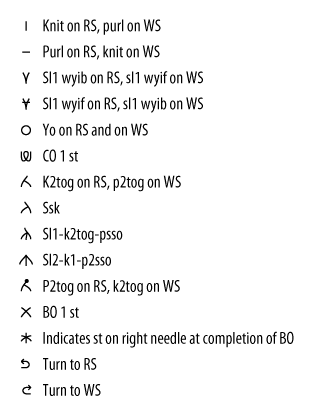 As you’d expect, it contains symbols for short-row turns, since every pattern in the collection uses them. 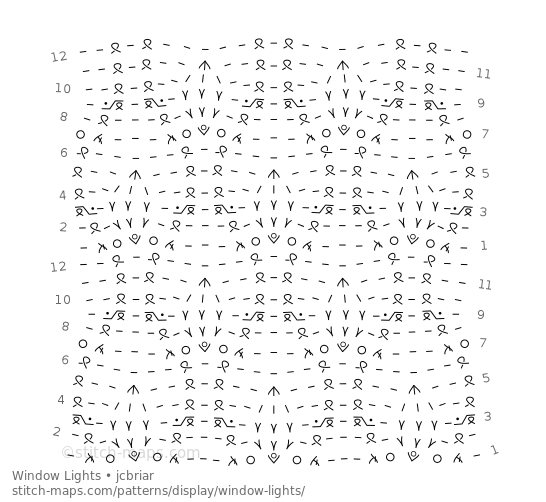 It also contains bind-off symbols, even though Diamond Doily doesn't use them, because the other patterns do. And it contains the cast-on symbol, even though Diamond Doily is the only stitch pattern that uses that symbol. 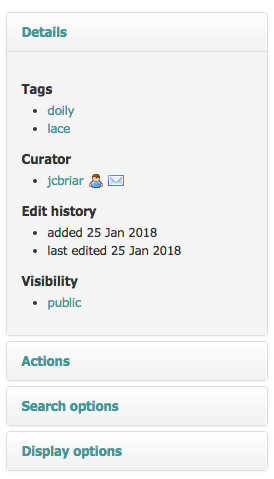 I’m pretty keen to use this feature myself. I figure it’ll be super useful when I’m putting together the handouts for the classes I’m teaching. Imagine this: create a collection containing all the stitch patterns shown in the handouts, export the collection’s key, put the key into the handouts as well, and boom! no need to worry about the handouts not defining a crucial symbol. Hopefully you’ll enjoy these little improvements. As always, if you have questions or concerns, please speak up! Start a conversation in the Stitch Maps group on Ravelry, or contact me directly. Stitch-Maps.com now handles brioche stitch patterns, via the brSl abbreviation and the and symbols. Brioche stitch patterns are notoriously difficult to chart. Part of the problem is that each stitch in a typical brioche pattern is essentially worked over two rows. Showing exactly what happens to each stitch over the course of those two rows tends to result in cluttered charts that don’t reflect the “gestalt” of the pattern. You get to see every little twig and branch of every tree, but the forest gets lost. 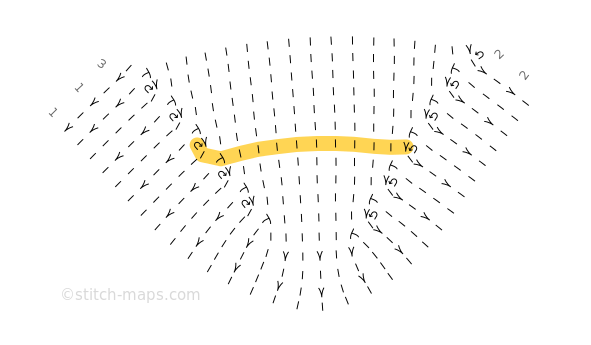 And so in adding support for brioche stitch patterns to Stitch-Maps.com, my primary goal was to find symbols that would result in clear, expressive, easy-to-read stitch maps – that is, to keep the stitch maps as simple as possible, so that the patterns could shine as brightly as possible. Both mean precisely the same thing: “brioche slip,” that is, slip a stitch purlwise and yarn over at the same time. 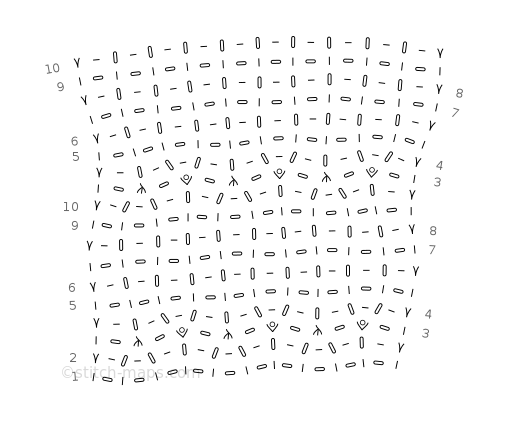 This results in two loops that need to be treated as a single stitch on the following row. Naturally, you may be wondering why two symbols are necessary – in particular, two symbols that look an awful lot like those for knit and purl. 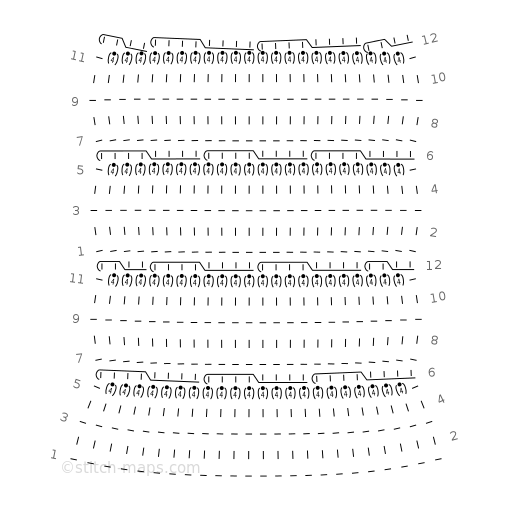 Here’s the thing: when you enter brSl as part of your stitch pattern’s knitspeak, Stitch-Maps.com will figure out automatically whether it should display or , depending on how the stitch is worked on the following row. 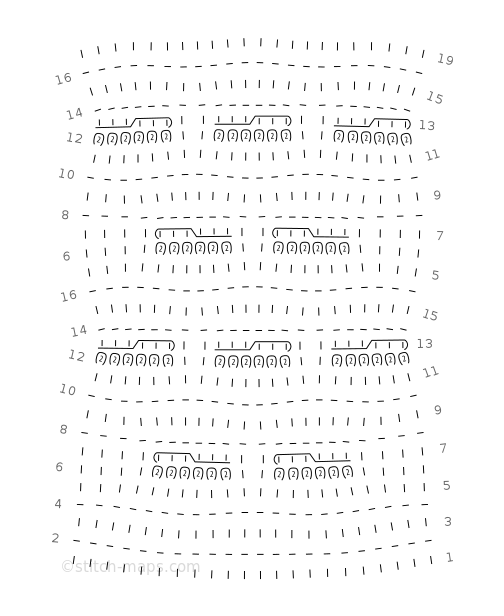 If the stitch is knit on the following row, Stitch-Maps.com will display . If it’s purled, the site will display . In this way, you’ll get symbols stacked on top of , and symbols stacked on top of . 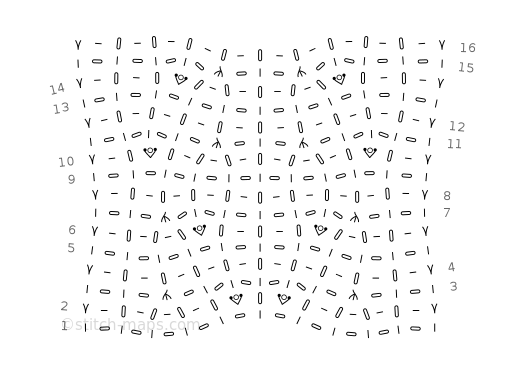 And this stacking is the key to clear and expressive stitch maps. It’s what lets the ribbed nature of many brioche patterns to shine. Let’s look at a few examples. S-Twist is one of the first patterns in Knitting Fresh Brioche by Nancy Marchant. It’s also one of the simplest. At a glance, you can see that on most rows you’re just maintaining plain brioche rib. 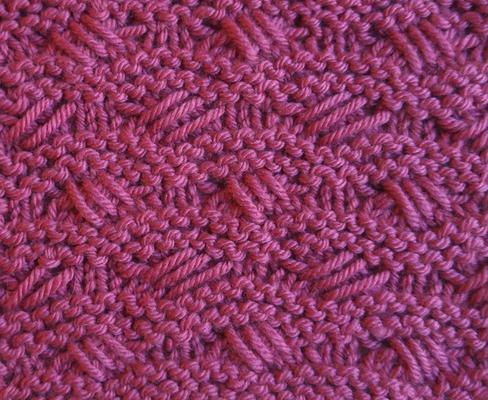 It’s only on row 3 that you create the actual S-Twist pattern via increases and decreases. Fanny and Feathery – also from Knitting Fresh Brioche – is somewhat more dramatic. Check out those 1-to-9 increases! This pattern is new. It’s a brioche version of Thistles. I haven’t tried knitting it yet, but it looks promising. And I am tempted to create brioche versions of other lace patterns. Given my apparent fondness for Knitting Fresh Brioche, you may also be wondering why the abbreviation for and is brSl, and not the more common sl1yo. In a nutshell: it’s a limitation of the knitspeak parser at Stitch-Maps.com. The way it processes knitspeak, it wouldn’t be able to distinguish between sl1yo and sl1, yo. And so a new abbreviation became necessary. I hope you don’t mind. I also hope you’ll give these new symbols a try. Map some of your favorite brioche patterns (or make up new ones!). 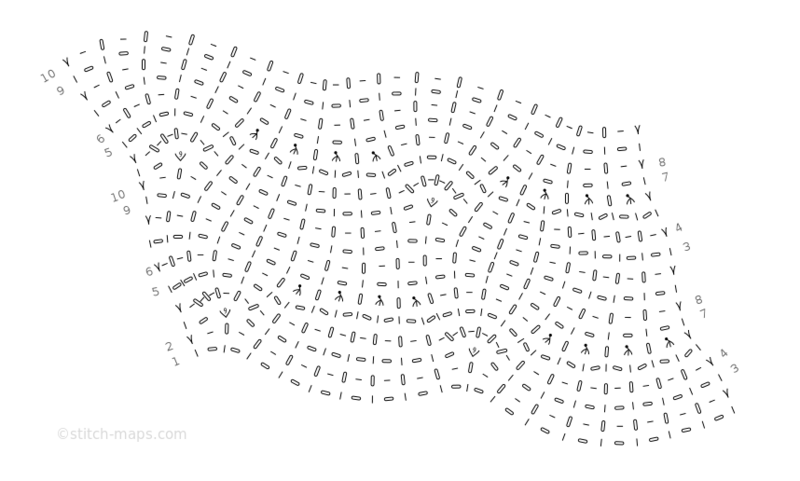 And, as always, if you encounter any weirdness with this new feature at Stitch-Maps.com, please let me know!